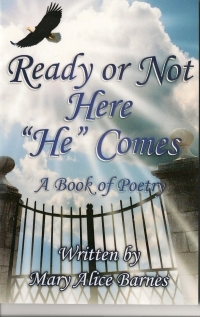 recently published a book of poetry entitled' Ready or Not Here"He"Comes. This is the poem that started my journey. Jesus gave me this poem, and said, "Write it to the whole world." to let them know I’m coming back for every man, woman, boy, and girl. People, “Get your act together and get your soul right. listen to what I’m saying “as I won't ever tell you a lie. Because if I return and you're not ready, your soul will surely die. Get yourself in a hurry and don't worry who is right or wrong. Get your act together because the time is not too long. Talk to your children and make amends with your enemies. Because if fault is found in you: you will be damned eternally. So every man, woman, boy, and girl will know that I am near."